After getting my husband hooked on those fancy razor systems I knew we’d needed to come up with a way to save money on the razor refills. 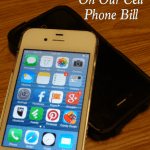 Well, we did just that and I’m sharing my top secret tips with you! Please tell me I’m not the only person who is amazed at the cost of razor refills. I mean, how expensive can a little bit of plastic and metal be? Ok, never mind that theory. I’m stepping down from my soap box to show you how we save money on razor refills! One of the cheapest places I found to buy razor refills was on Amazon. To top that, a few years ago we learned about their Subscribe and Save program. Have you heard about it? For each item that you subscribe to through the program you receive a discount of 5%. You can choose to receive your subscription every 1-6 months, and orders are delivered around the 13th of the month. Did I mention that you also get free shipping on your subscriptions! Plus, when you have 5 or more subscriptions that arrive in the same month, you’ll save 15% on your entire order. I have found that Amazon has the cheapest razor refills around, so I’m not sure why you would cancel. But don’t take my word for it…head on over to Amazon and search for your favorite razor refills. 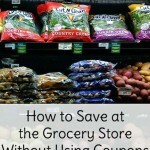 Tip: Don’t forget to look for Subscribe and Save Coupons to save even more money! I know you think I’m totally crazy, but dipping your razor in rubbing alcohol really works. We’ve been using this trick for forever and it stretches our razors even further. Woot! Tip: Since your shower is moist and wet, I don’t recommend that you put your razor back in it once you’ve dipped it. 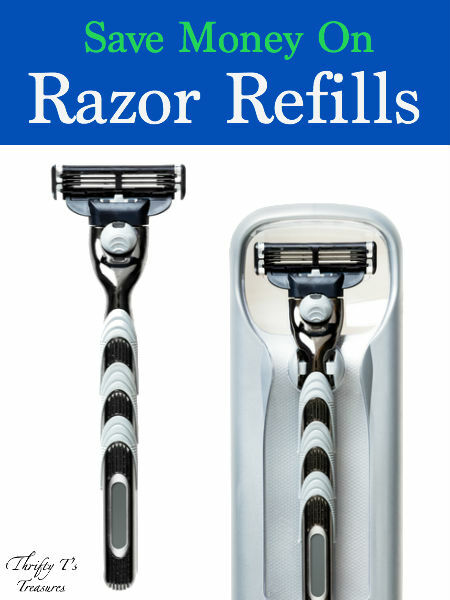 How do you save money on razor refills? My husband got hooked on these awhile back too. We just discovered something called dollar shave club that sends out 4 razor blades every month (and a handle the first month at no extra cost). We picked the one that looked the most like the gillette fusion proglide and it’s $9 a month for all 4 blades. The best part is they’re delivered right to your door. And, my husband loves them as much as the gillette ones, so we’re all happy! Hi Dione! I’ve heard of Dollar Shave Club, but we’ve never tried it. I’m glad to know of another option. Thanks for sharing! Thank you so much! I use Amazon for everything, but had never thought about looking for razor refills. I did exactly what you did (years ago) and bought about ten razors for nearly free, and now needed refills. I was too cheap to get them at Walmart. Just ordered from Amazon for $17.79 subscribe and save + coupon. Much better price! I’m excited that you were able to snag this deal too; thanks for letting me know. I’m not sure I completely understand, but I’m interested in reading more about Subscribe and Save with Amazon. I have a couple of products I have to order through them somewhat regularly. Each time you order an item through Subscribe and Save you receive a discount of 5% (whether you receive it every month or every six months). If you have 5 separate Subscribe and Save items that arrive in the same month, you receive a discount of 15% on each item. For instance, if you order razors, toilet paper, toothpaste, etc. under the Subscribe and Save option and they are all delivered in the same month, you’ll receive a discount of 15% for all of your items. If they arrive in separate months, you’ll only receive your 5% discount. I love Subscribe and Save not only for the discount but also for the free shipping! Hopefully that helps you understand a bit better! Thanks for sharing this and spreading the love so others are also able to save! I hadn’t even thought about looking for razors on Amazon, thanks! My dh gets his at Costco, but they don’t carry MY brand, so I’ll be checking. They’re SO expensive! I totally agree Shecki, razor refills are outrageously expensive! Fingers crossed that you’ll be able to find your brand at a fabulous deal on Amazon. My husband just by in a bulk package in the supermarket. That’s great that he finds a fabulous deal at the store! Thanks for sharing Adelien! Another way to save on blades – extend the blade’s life span by blow drying it after using it. My husband likes the expensive brands (currently Hydro 5, $21.00 for 8 pk) and is able to use the same blade for 4 weeks! Thanks for the fabulous tip Elizabeth! I’ll definitely pass this on to my hubby! You can use coupons on amazon? And with this subscribe and save can I joina and cancel as I please….meaning when I see a good offer join then cancel after I get it? 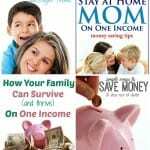 Heidi, Amazon has their own coupons (see a full list here – http://ow.ly/u1eQK) for particular items. So, to answer your question, yes, you can use coupons, but only Amazon’s coupons. Yes, with subscribe and save you can subscribe and cancel as often as you’d like. (If it’s the best price around, I’m not sure why you would want to though.) I don’t recommend that you cancel until you’ve receive your item.